Oh dear. Its been over a year since I posted anything on the blog. Tut tut. But rather than offer up any excuses I’m just going to show you a picture of a tulip bulb that we brought in from the cold a couple of weeks ago, which had started to sprout but hadn’t been planted deep enough in the ground. I’m glad we did as although it had been extremely mild up until Christmas, on the 27th December we had 30-40cm of snow and the temperatures plummeted to -8C. 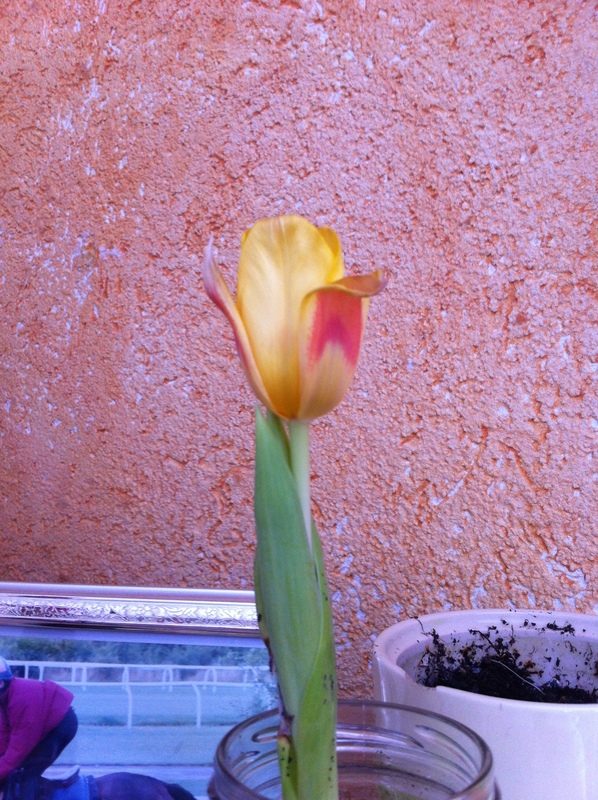 Two days ago, this little beauty flowered. Dino Girl is now 3.5. A year ago (i.e when she was 2.5) she didn’t speak much. There were very few words that were recognisable to other people, but not many more that only we could decipher. Then suddenly a few months before her 3rd birthday, her speech exploded. We had proper words and sentences and she could be understood by just about everyone. But, there are (along with a few dodgy sounds) a few things that only we can understand. This is nothing to do with her speech ability but more to do with her understanding of whats being said around. 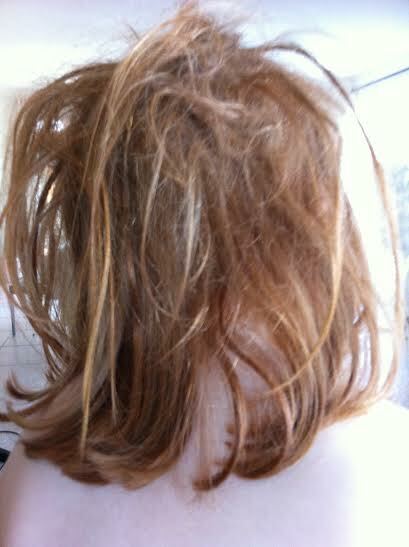 And, just because I despair of it, here’s a pic of her bird’s nest hair. I know the more I leave it, the worse it will get, but it already seems past the point of no return. About 6 months or so ago, Lego Boy started at an art class. He’s not really shown too much interest in drawing before, much preferring to have Lego bricks in his hand than a pencil. But this group is held on a Wednesday morning and is attended mainly by homeschoolers (which is a rarity here, there are very few homeschool-specific groups) so we thought he could try it out and see how it went. Right from the start it became clear that Carmen, his teacher, has a passion for art, and a passion for sharing that with her classes. If I’m honest, I wasn’t expecting too much from Lego Boy, based on his previous lack of interest in the subject. So when we were invited to a La Joconde exhibition (thats Mona Lisa to non-francophones) I was interested to see what he had produced, particularly as he hadn’t been in the class long. The difference in his art in just a few weeks was incredible. At the exhibition there were slips of paper with adjectives on. We had to stick an appropriate word below the pictures that we liked. At the end, each child got a certificate according to the most popular word under his/her painting. La Joconde la plus brillante. 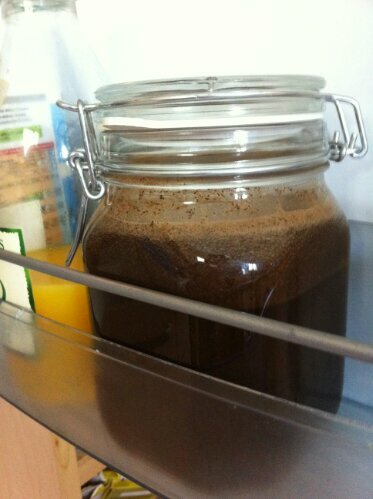 This afternoon I have started to make a batch of cold-brewed iced coffee, following the method blogged by the lovely nexttonicx. 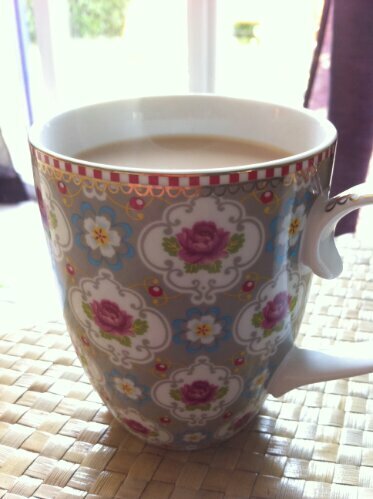 I only drink tea from this mug, and it’s just perfect for when I feel like something special, but I don’t want to get out the teapot and one of my many mismatched cups and saucers. 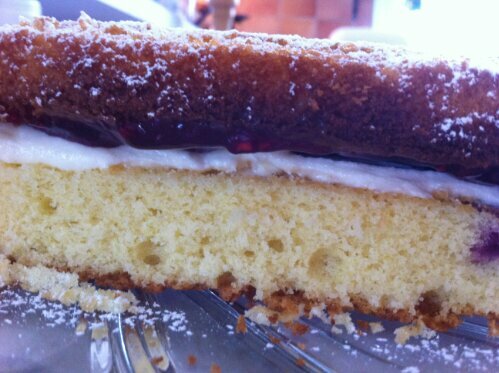 So, afternoon tea (even though it’s only 2.30pm) wouldn’t be complete without a piece of cake. So I have my spice cake with honey glaze in the oven. I’m sure there are healthier ways of using excess eggs than via cake, but none are as tasty…. Last Saturday was the second of two artisanal open houses I hosted at our house. In the lead up to them, I was very busy making lots of stock (and worrying that I didn’t have enough), organising the vendors and making sure that the house was clean and tidy (not a mean feat with 2 children at home all day, although I can’t solely blame them; I’m not a very spick-and-span kinda person). That’s one of the reasons why I’ve been a bit slack in the blogging department. After all, all the other daily stuff (washing, educating the kids etc) had to be done too whilst snatching moments to sew. It was hard to find the right time to host these events. The first was on a Thursday morning, to catch I hoped, the school mums, who after dropping Johnny and Ginny at the school gates fancied browsing some gorgeous handmade goodies and having a cup of tea and some cake. We had 5 people come. (I guess some marketeers would say I shouldn’t be telling you about the times that are less than successful, but I say, sod it, its the truth and it shows that this stuff isn’t plain sailing). I’d like to say that Saturday dawned bright and sunny. But I can’t, as it didn’t. The weather could’ve been worse, granted, but there was just enough rain that made me wonder if anyone would want to come out. However, I’m pleased to say that our friends, neighbours, colleagues and acquaintances didn’t let us down. There was a constant buzz in the room, with lots of chatter going on, and even some purchases made! We also had a free draw with all the vendors contributing so several guests got a nice surprise over the next couple of days. I think a comparison of the two days can be made by the amount of cupcakes from Kids Party Cupcakes left at the end. We are planning on holding more events, probably in September and just before Christmas, so if you are interested in coming, then drop me a line and I can add you to the invite list. So, who were the lovely businesses who participated? First up, me, Twinkly Things, selling my handmade bags and rucksacks, made from PVC and other repurposed materials. 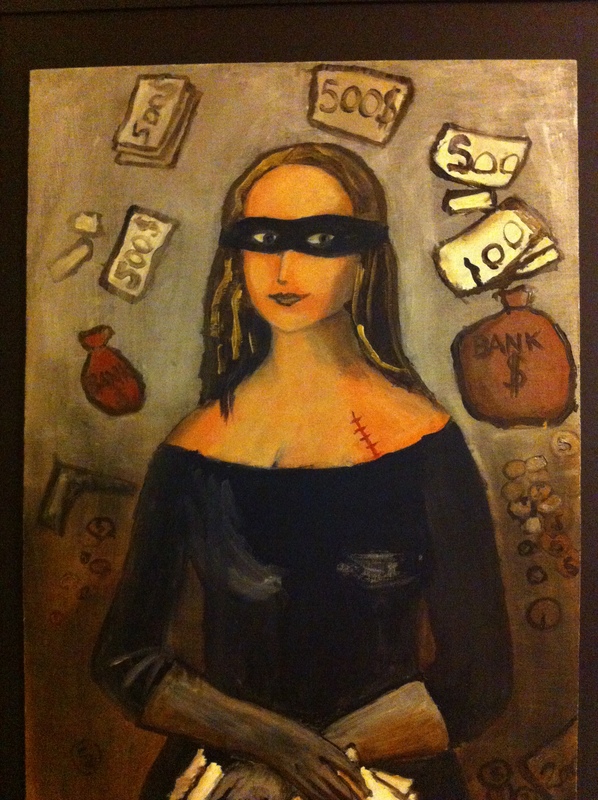 I have a gallery on this blog under Creations For Sale. Dika Designs – Marika makes handmade cards using fabric and other nick-nacks. She collaborates with textile artist Karin Wheals to make cards with handmade lace designs too.